June 9 Birth in Québec City of George Edmund Alleyn, son of Richard Alleyn and Lelia Devlin. Siblings Nora and Richard will follow. Summer Encouraged by his aunt Nora Devlin Jones, an amateur painter, he paints outdoors, making pictures of sailboats and forest landscapes. Becomes a boarder at the Jesuit Collège Jean-de- Brébeuf in Montréal. He publishes caricatures and satirical drawings in the student newspapers Loustic and Brébeuf-Matin. Summer He goes painting in the Gaspé region and while in Port-au-Persil meets Jean Paul Lemieux, who is teaching at the École des beaux- arts de Québec. September Enrols in first-year philosophy at Collège Saint-Charles-Garnier, in Québec City. He drops out in January 1951. September On the recommendation of Jean Paul Lemieux, he is admitted to the École des beaux-arts de Québec. 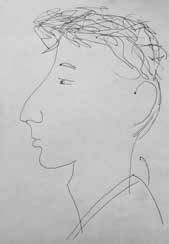 This is the start of Alleyn’s friendship with the artist, who introduces him to the work of the Impressionists, Van Gogh and Picasso. Exhibits at Paul Gessell, on Daly Street in Ottawa. During the summer he paints in the Gaspé. 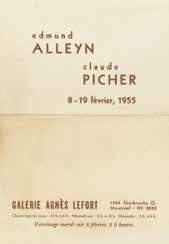 Alleyn rents a small studio on Rue Saint-Gabriel, in Québec City, which he shares for a while with the artist Claude Picher. April Holds his second solo exhibition (oils and watercolours) at the gallery L’Atelier, 12, rue Sainte-Anne, Québec City. Attends St. Patrick’s, an English primary school in Québec City. He spends his summers on the shores of the St. Lawrence, in Kamouraska. His father, who wants him to become a doctor, decides he should continue his education in French and enrols him at the Jesuit École Saint- Charles-Garnier, in Québec City. This forced switch from English to French leads to serious problems at school. Victim of an attack of acute dermatitis, he is admitted to the Royal Victoria Hospital, in Montréal. The convalescence lasts until April, and Alleyn becomes depressed. His interest in painting increases after he sees The Ferry (1907), by James Wilson Morrice. While at the École des beaux-arts de Québec, Alleyn makes his first experiments in non-figura- tive painting. the respective merits of Automatisme and figura- tive art. Île d’Orléans, where he paints. 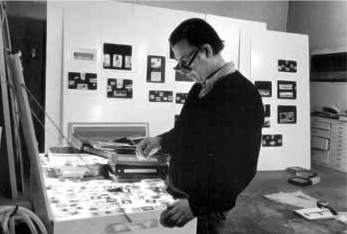 The area attracts other artists, including Claude Picher, Denys Morrisset, Marcelle Maltais, Micheline Drouin, François Soucy, Jean Préfontaine and Pierrette Filion. September 22 Wins the Grand Prize in the Concours artistique de la Province de Québec for his painting Sur la grève. October 13 Arrives in Paris. Recipient of a two- year grant from the Royal Society of Canada, Alleyn lodges at the Cité universitaire, enrols at the École des beaux-arts de Paris (which he attends rarely) and works occasionally at the Académie Julian near the Champs-Élysées. March Alleyn visits Simone Aubry and Paul Beaulieu in London, U.K.
Summer Spends the summer in Provence. He paints in Aix-en-Provence, frequents the art community of Vallauris and meets Picasso. 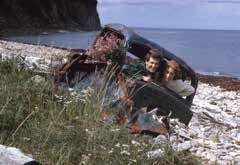 He later makes trips to La Ciotat and Collioure. Back in Paris, he begins to consider settling permanently in France. March 1 Alleyn moves into a two-room apart- ment at 146, rue de Charenton, in the Bastille neighbourhood of Paris. March Second trip to London. Summer Resides temporarily in Saint-Jean-de- Luz, near the Spanish border. 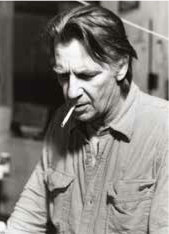 January Along with the other painters in the Canadian section, Jean Paul Riopelle, Jack Shadbolt, Tony Urquhart and John Coughtry, wins a Guggenheim International Award. Summer Following an overnight fire in his stu- dio, Alleyn spends ten days in the Saint-Antoine hospital, in Paris, and then travels to Rome to convalesce at the home of his friend Pierre Pouliot. Visits the Venice Biennale with Suzanne Bernier. November 1 Alleyn returns to Paris and rents an apartment at 93, rue du Monument, in the out- lying suburb of Champigny. September Alleyn moves temporarily to Courbevoie. Receives an honourable mention at the 5th Bienal de São Paulo, where he exhibits five paintings. November 24 Returns to Québec City, where he stays for a while with his parents before moving into an apartment on Place Royale. He sets up a small studio on Rue Saint-Gabriel. Performance by Suzanne Rivest (expressive dance) to music by François Morel in front of Alleyn’s painting La Crevasse during the opening of his exhibition at Galerie Denyse Delrue, Montréal. 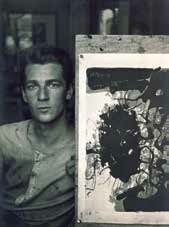 March Represented by Edmund Alleyn, Léon Bellefleur, Paul-Émile Borduas, Jean Paul Riopelle and Harold Town, Canada wins the 1960 Guggenheim International Award for best national submission. Summer Spends a week in Percé with the artist Micheline Beauchemin. Along with the artists Jean Paul Lemieux, Albert Dumouchel, Graham Coughtry and Frances Loring, he represents Canada at the Venice Biennale. Alleyn lives with his friends Jean and Béatrice Maillé and paints in a studio near Boulevard Saint-Denis, in Courbevoie. February Visits Ostend and Bruges. May 12 He buys a former warehouse located at 49, rue Liancourt, in Paris’s 14th arrondissement, which he converts into a studio. It will be his home until 1971. 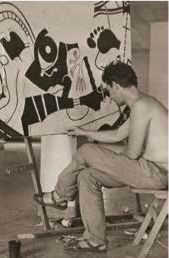 Summer Travels to Spain and visits Madrid and Toledo, where he is particularly impressed by the work of Goya, Velázquez and El Greco. Summer Alleyn meets the artist Anne Cherix, his future wife, at the La Coupole restaurant, in Paris. Summer Holidays on the Côte d’Azur and in Italy. November Meets Cheval-Bertrand, Bernard Rancillac and Jacques Monory. Easter Visits Antwerp and Amsterdam. June 27 Edmund Alleyn marries Anne Cherix in Lausanne, Switzerland. Summer The young couple spend time in Percé. January Alleyn becomes friendly with the musi- cian Philip Glass. March-May Creation of Du fil à retordre by Edmund Alleyn, Philip Glass and Graziella Martinez, a sketch for a show presented from March 21 to 28 on Rue de la Montagne-Sainte- Geneviève, Paris, and restaged in May at the American Center in Paris. Summer With Anne Cherix, visits the island of Palma, in the Spanish archipelago of the Canaries, and vacations in Saint-Raphaël, in the south of France, at the home of the artist Cheval-Bertrand. September 18 Cheval-Bertrand commits suicide. Alleyn is deeply affected by his friend’s death. Summer Following an invitation from the Cuban government, Alleyn spends six weeks in Cuba with fifty other painters, printmakers, sculptors and poets, who include Adami, Arroyo, César and Michel Leiris. On July 17 he participates in the creation of a collective work entitled Mural on La Rampa, in Havana. He also visits Santiago and makes a trip to Mexico City. 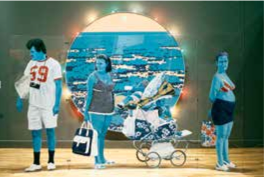 Summer Presents work in two exhibitions at Montréal’s Expo 67, in the Québec and French pavilions. Fall Alleyn spends a week at the home of Philip Glass in New York, where he attends an event presented by the Experiments in Art and Technology collective. May Alleyn takes an active part in the May 68 events in Paris. Produces posters in the basement of the École des beaux-arts de Paris in support of the strikers. Puts an end to his association with Galerie Blumenthal-Mommaton in Paris and Galerie Soixante in Montréal. October Makes a brief visit to Montréal, where he applies for a grant to execute Introscaphe 1. December Alleyn begins working on Introscaphe. Makes a short trip to Holland. Introscaphe I, Salon d’exposition du Grand Théâtre de Québec, Québec City, November 27 to December 24. The exhibition is cut short, on December 2, owing to technical problems. Edmund Alleyn and Anne Cherix separate. 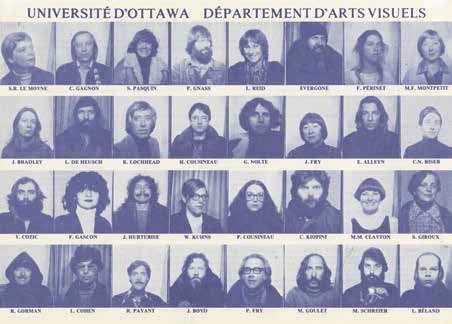 Begins teaching at the University of Ottawa, where he will remain until 1991, giving courses in drawing and painting, and heading up the interdisciplinary studio course. He is one of the department’s founding members, who also include Charles Gagnon, Lynne Cohen, Evergon, Thierry de Duve, Michel Goulet, Gunter Nolte, Johanne Lamoureux and Christian Kiopini. Under the technical direction of Pierre Bédard, Alleyn experiments with video and produces a 4-minute colour video clip showing variations of sequences of images that he has modified and remodified using a camera and a video processor. Birth of Jennifer Alleyn in Lausanne. Alleyn directs and produces the film Alias. September Completes Introscaphe. Over eight hundred people engage in the Introscaphe experi- ence during its presentation at the Musée d’art moderne de la Ville de Paris. 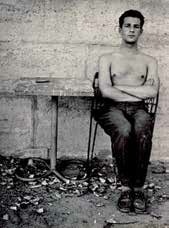 October 27 Alleyn takes part in the show presented by John Cage at the Halles de Baltard in Paris. Alleyn returns to Québec and settles in Montréal with Anne and their daughter Jennifer, living first at 33 Winchester, in Westmount, and later on Van Horne, in Outremont. He buys an abandoned warehouse located at 3853 Clark, and over a period of nine months converts it into a studio. 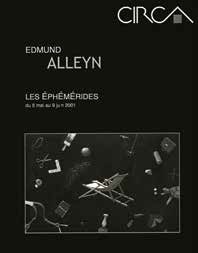 On June 14 Radio-Canada’s FM service broad- casts Un artiste et son milieu, a long interview between Alleyn and the art historian Guy Robert. Spring Buys a summer cottage on Lake Memphremagog, Québec. 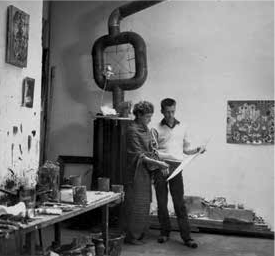 Beginning of Alleyn’s relationship with the artist Suzanne Pasquin. Summer Embarks on the creation of a public art work, a painted environment for the Édifice Jos- Hébert, a federal government building in Sept-Îles, Québec. 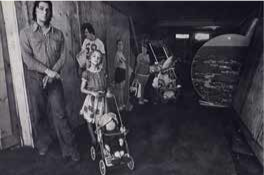 The installation, entitled Sept-Îles, hier et aujourd’hui (about a dozen figures painted on glass and four large paintings illustrating the history of Sept-Îles), will be completed in April 1980. Alleyn publishes “Pour un musée de la consom- mation,” in 03 23 03. Premières rencontres interna- tionales d’art contemporain, Montréal, Médiart and Parachute. July 1 Becomes a tenured professor at the University of Ottawa. 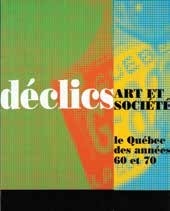 Sculpture au Québec – 1970-1980, Musée d’art con- temporain, Montréal, August 10 to September 14 Projet 80 (auction exhibition), Projet 80, Montréal. Executes three photographic triptychs for the Corporation d’hébergement du Québec, Montréal (completed 1985). Meets Anne Youlden, with whom he begins a relationship. March 28 Unveiling of a series of 35 photo- serigraphs on the history of Sault-au-Récollet, an in-situ work commissioned by the Centre hospitalier Fleury, Montréal. Begins a relationship with Suzanne Danis. Alleyn retires from his teaching position at the University of Ottawa. 30. 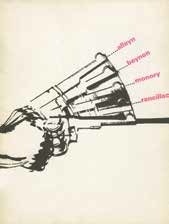 Poster for the exhibition Déclics. Art et société. Alleyn serves as member of the jury for the Prix Pierre-Ayot and Prix Louis-Comtois, awarded by the City of Montréal. Summer Now virtually a recluse, he spends the summer alone at Lake Memphremagog. May Contributes toward the book project Indigo sur tous les tons, instigated by Jocelyn Jean, Gilles Lapointe and Ginette Michaud. The work is pub- lished in 2005 by Les éditions du passage. December 24 Edmund Alleyn dies, in Montréal, of cancer.